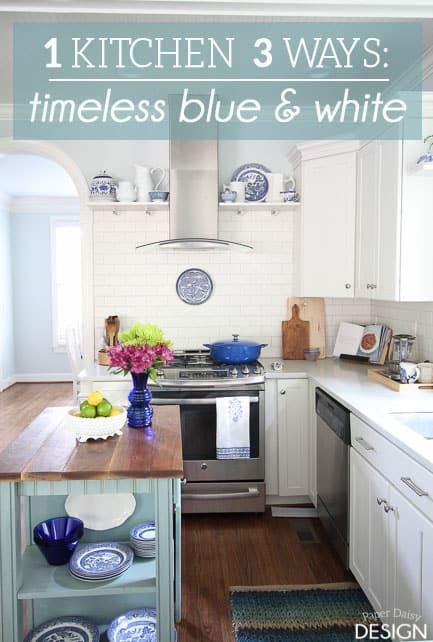 I’m back with the 2nd installment of 1 White Kitchen 3 Ways: Blue and White is the look today. 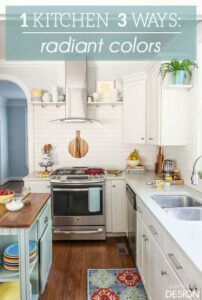 While the all white is compelling and great for letting the bones of the kitchen shine, I must admit that I am more of a color person and blue happens to be my favorite. 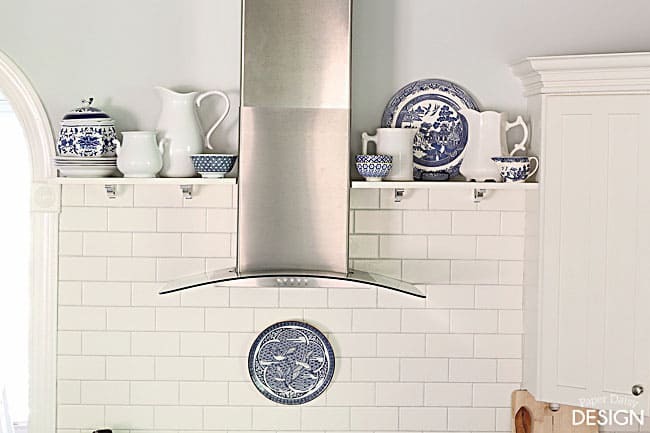 Blue and white in design has been very hot in the last year or two. And I started collecting it around that same time. Picking up a piece here and there. But honestly, design aficionados everywhere proclaim that Blue and White will never go out of style. 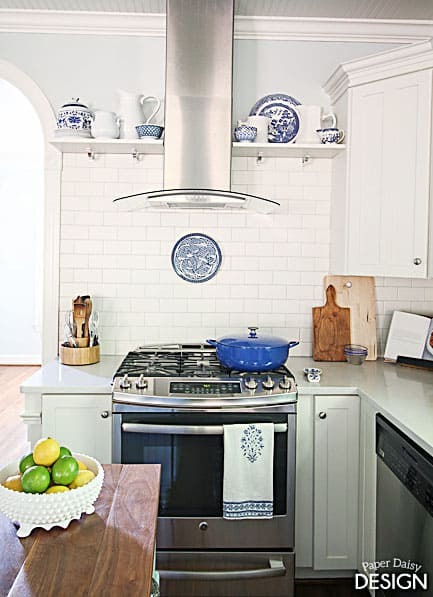 I tried to keep this often very traditional kitchen styling updated by adding in contemporary takes on the classic blue and white china. 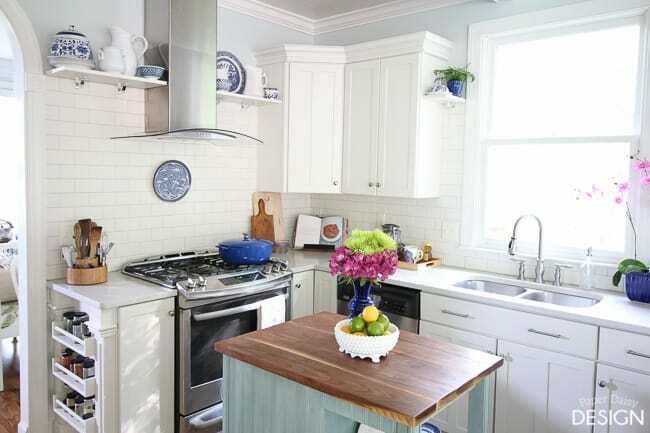 And there you see the rug that inspired today’s version of the white kitchen. Explanation here. 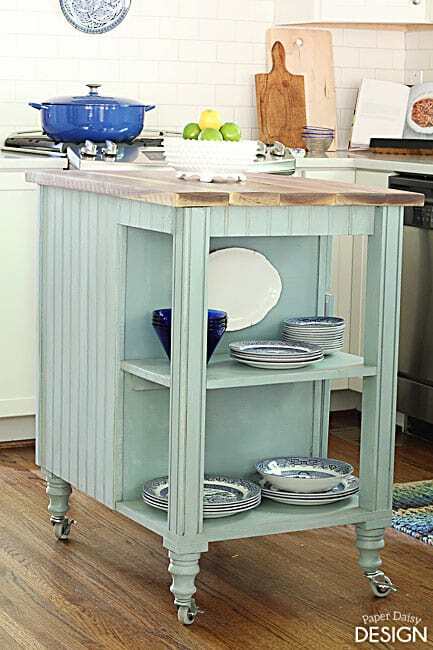 Our light turquoise DIY Kitchen Island Cart is well suited for the elegant blue dishes. I was lucky enough to score these classic dishes at a garage sale earlier this summer. 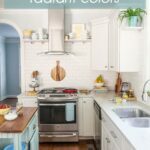 With the high contrast of the intense blue and soft white, the injection of pink brings a cheerful energy to the sink area. 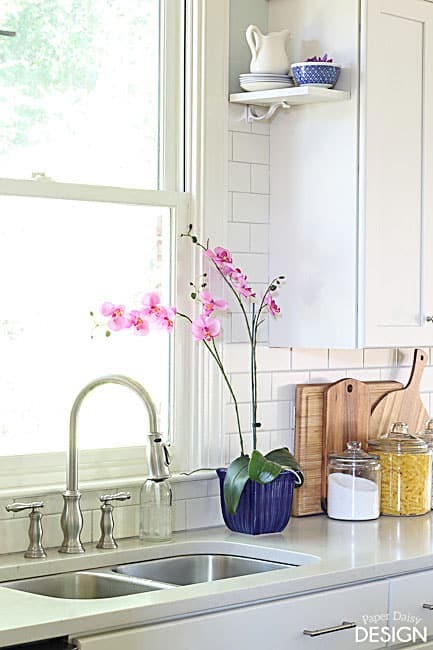 Like in the all white kitchen, plants are my favorite accessory. Here are a few more wider shots the room. 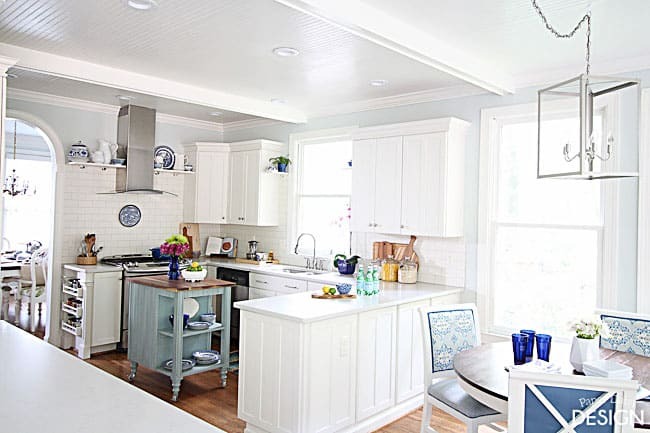 The eat-in area really shines with the blue and white palette. 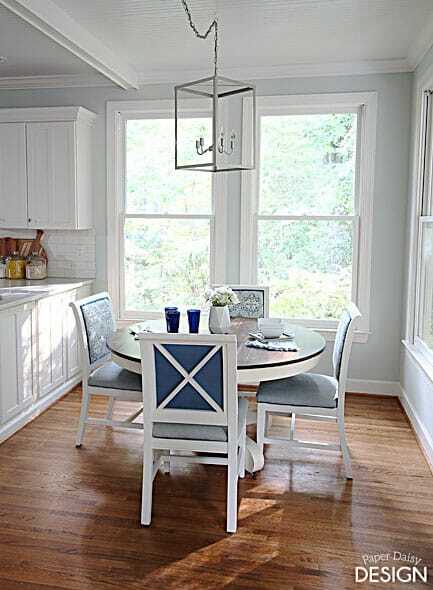 The playful ikat and contrasting trim on the chairs mimic the rest of the kitchen. Surprisingly, they were Craig List finds, originally dark wood and black leather. 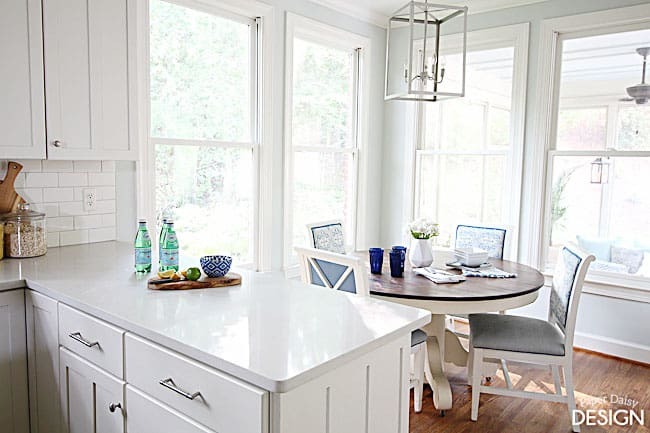 Yet another testament to the power of paint and fabric to transform ordinary chairs. And would you believe the lantern is also a DIY project? Yep, more on that to come. 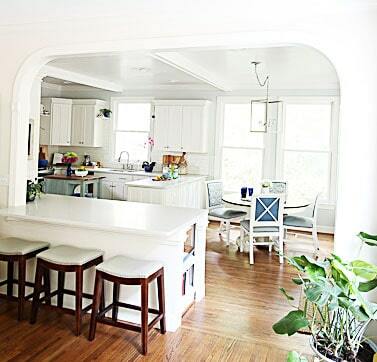 The arches that adorn the transitions were part of the charm that really made me fall hard for this house. We expanded this archway as part of the remodel of the kitchen. 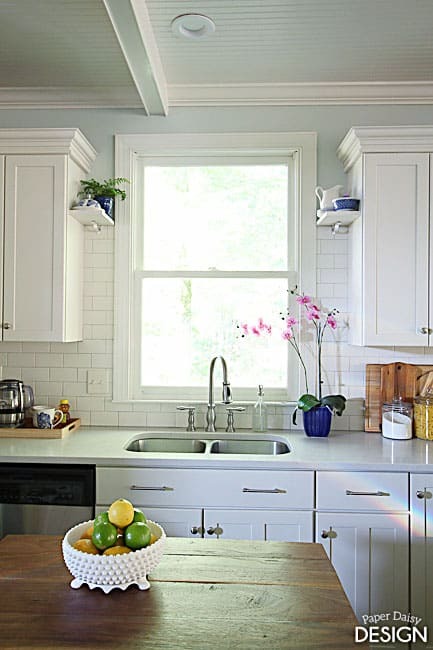 Giving both spaces an openness that was lacking previously. 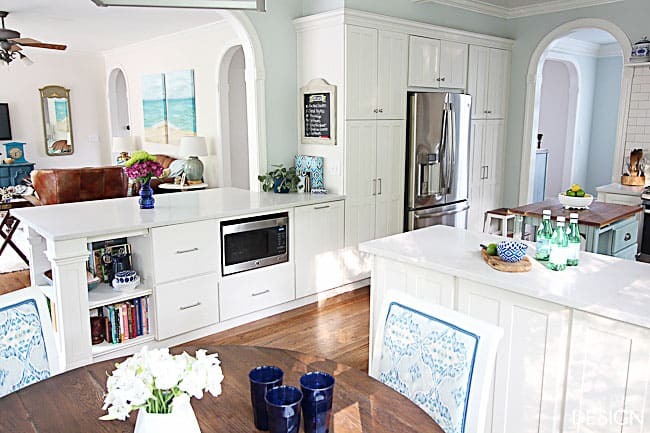 Not only did the new peninsula allow for additional seating while entertaining, it also gave us more storage, most especially a garbage can pull out to the right and a convenient place for the microwave in the center. While we were lucky enough to be able to order matching Kraftmaid cabinets from Home Depot, I designed and built the bookshelf on the end to be large enough to store my growing collection of cookbooks and revolving display of my favorite things. 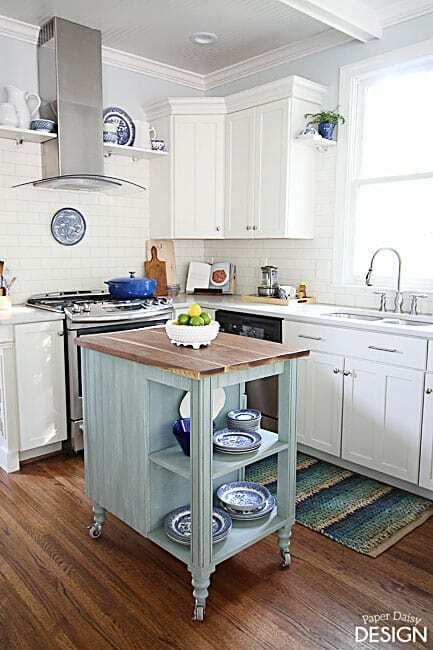 While the open shelving trend is not for everyone, a bookshelf is a easy way to add extra storage to the end of an island or transitional space. 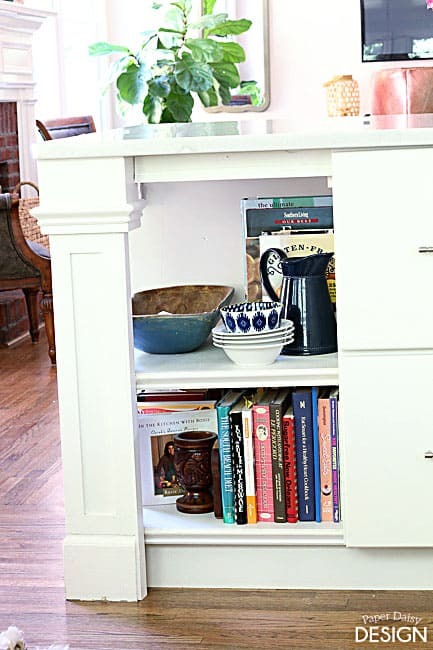 I have added some form of built-in bookshelf in my last three kitchens. In the last kitchen, I converted an underused wine rack to a book shelf. 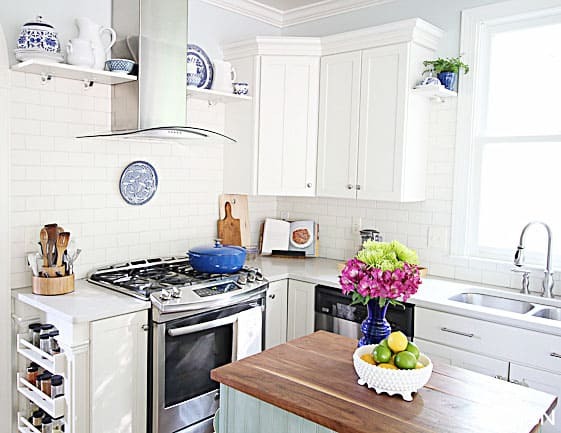 If you compare this Blue Kitchen to the previous Classic White kitchen, the simple additions of blue and white ceramics provide a jolt of color while still feeling casually classic. 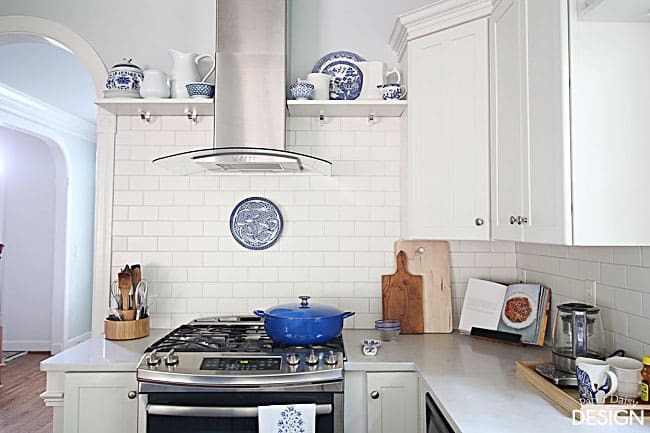 Mixing the solid white pottery with the blue and white china keep the shelves from feeling cluttered, allowing your eye to find rest amongst the ornate blue and white patterns. I must admit I am EXTREMELY fond of this version of the kitchen. I knew I’d like it, but y’all, I really am wanting it to stay like this. 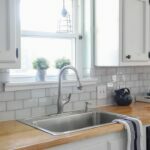 I especially love highlighting the plate on the backsplash, a treasure found antiquing this summer while on vacation in Fairhope, Al. 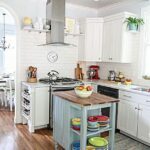 Would it be crazy to restyle your kitchen every few months? Because I’m thinking I could easily be persuaded. As promised here’s another before photo. 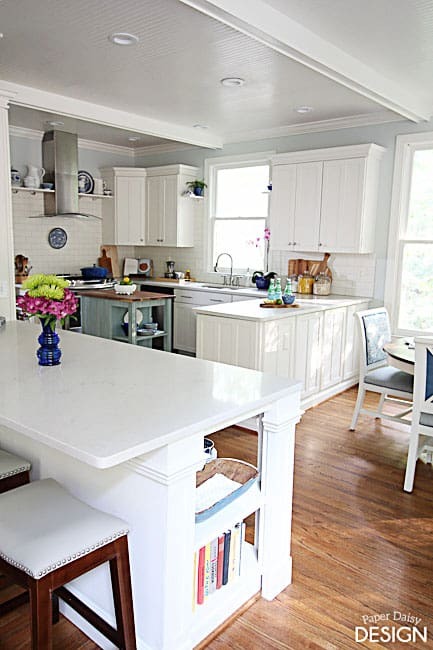 The desk and cabinets above were removed to open up the space. It really is amazing what 4 feet can do for a space. 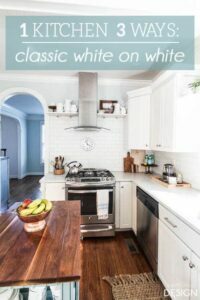 Stay tuned for the next version of the White Kitchen in a few days. So, tell me would you stop here or can you imagine another look? 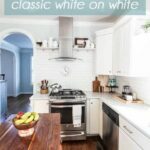 Check out the other versions of the White Kitchen! Links provided for your convenience, some links are affiliate links. 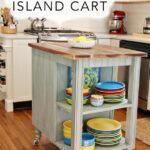 At no cost to you, I receive a small commission for the referral if you decide to make a purchase. Wow! Thank you for the feature. Hope things get into a groove for you. Back to school can be so hectic! Woodworking is my passion. I am working on building with an open floor plan. I am looking for ideas. 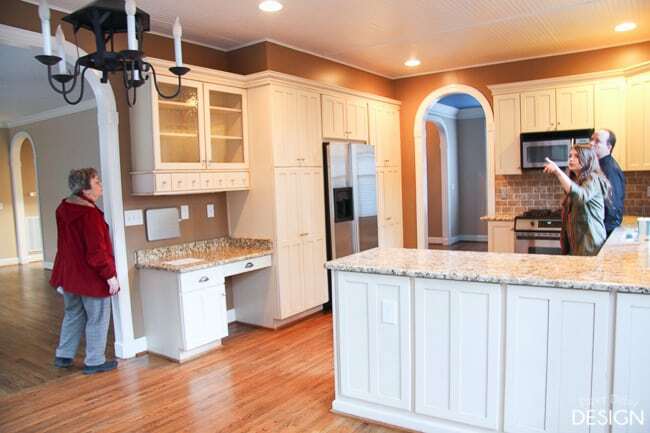 Your kitchen is impressive.